The pure Electric version is the blue car. The Green one is the plug-in. Which is pretty good. Not as good as the Volt, but much better than the Fusion. 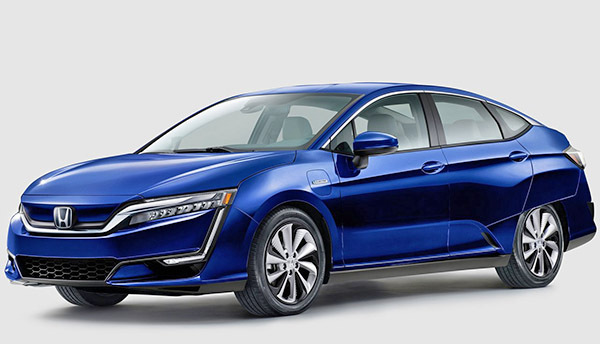 While Honda has not disclosed the total range of the EV version officially, previous rumors were mentioning a pathetic 80 miles. Inside, same story as the Hydrogen version. I like the bottom color combo better (The Plug-in version). But both colors might be available on both versions, who knows. I think the EV version with its 80 miles is the stupidest thing I've heard since the pricing of the $75 000 Cadillac ELR. On the other hand, the plug-in, with its 42 miles EV range makes much more sense. But no matter what, you'll end up with a design that is pretty hard to swallow. I mean, it'll take a lot for this to grow on most people. This is the worst exemple of what happened to Honda design. 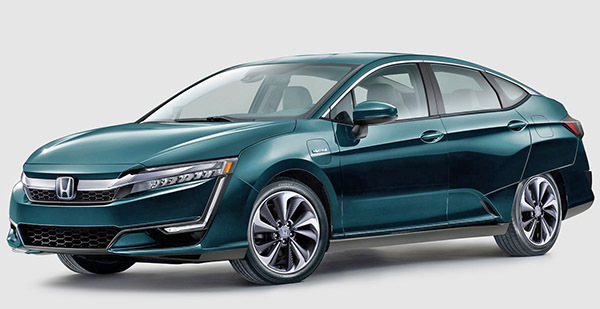 Get ready as I'm sure the Accord is close to this in design. I think the Accord will end up looking like a cross between this and the current Civic. Design is way too polarizing. They should have used Accord design and convert to a liftback. In terms of range don't forget the Sonata PHEV which gets 27 mpg and looks bit better (but less cargo). There were Accord spy pictures while ago and certainly looked a lot like a bigger Civic. So better I think than this. I wish auto makers would stop insisting on branding their cars with the front end forced design. I'd rather have Honda/NASCAR logos all over my car and a clean consistent design than whatever this is. A good designer could design a front end that is complimentary to the rear wheel skirt - though management would have to abandon the front end branding. Also, I'm starting to see more people referring to PHEV's as just Hybrids and dropping the 'plug-in'. This is really annoying - this would have made a nice 'conventional' hybrid. Amazing that such a little Hybrid is no more efficient than an 8-passenger Chrysler Pacifica Hybrid. Pacifica is not nearly as efficient. Just compare the mpge. But this is not a hybrid so maybe that's the confusion.